Post Rock Family Medicine » Same Day Appointments! Many visits to the emergency department can be avoided by seeing your primary doctor. 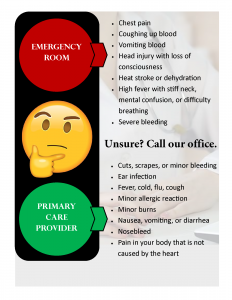 Seeing your primary care provider in the office can help avoid the high treatment costs that come with an emergency room visit. Our doctors have same day and next day appointments available to accommodate our patient’s needs. Check out this tool to help you determine where you need to be seen. Give our office a call today! Our staff will gladly answer any questions that you may have.